We have gathered some memorabilia here to display what is around but not necessarily available. Although we have quite a few examples we really haven't even touched on the bulk of Brock collectables. We will be attempting to gather together the largest resource of Brock memorabilia ever. We have a wanted, buy, sell and trade page, where you can do your own deals and bids with each other via message board style. 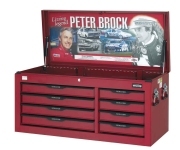 A superb new limited edition offer from 1-11, the tool storage specialists, featuring Peter Brock. Part of the Senator Legends Series, this range celebrates the career of Peter Brock showcasing some of his most famous machines. This collector's range is available for a limited time only. Visit 1-11.com.au for more information and to order your piece of history now. Stamps: Illustrated by Fredd Biggs.